Finally some decent but cold weather so I could take my new ES 12" Truss for a spin. Love the compact design...easy to assemble...and collimate. Observed the moon for a bit last night...and the amount of detail compared to my SW 8" is stunning. Took a number of pics with my Pixel smartphone. Here is one I am posting. 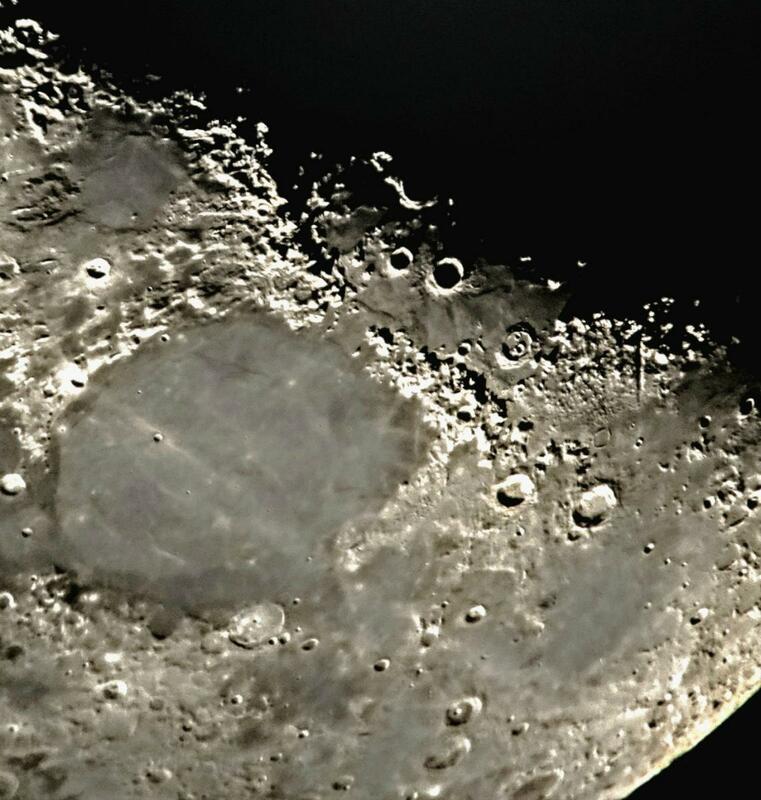 This pic was taken with my smartphone handheld to a Astro-Tech Dual ED Pardigm 12 mm eyepiece. Found a 2 burner grill cover at Amazon that works great to cover the scope at night (much much less expensive than a Scope cover). Then I braved 16 degree F temps at 4:30 am to observe M13 globular cluster...with my 12 mm eyepiece the pin **** stars were just stunning! My 8" would not detail the individual stars...just a fuzzy haze! Can't wait for warmer temps (and avoid frostbite) to spend lots of time outdoors with my ES-12! Glad the scope is working out for you. .
Then I braved 16 degree F temps at 4:30 am to observe M13 globular cluster...with my 12 mm eyepiece the pin **** stars were just stunning! My 8" would not detail the individual stars...just a fuzzy haze! Can't wait for warmer temps (and avoid frostbite) to spend lots of time outdoors with my ES-12! Glad for you that you were able to get out and observe. Here on the east coast there have been very few opportunities the last six weeks. I have plenty of opportunities, but with light pollution I don't bother. I asked my other friend to compare the 5" minidob I have him to the 8" f6 I loaned him. He is 26, 150 pounds, 5'9", plays video games, and has a few old finger injuries. He said the 5" did ok on several things, but that the 8" was impressive on nebula. He said the 5" is easy to carry, but the 8" is difficult to transport. He said it is easier to find stuff in the smaller scope. I have plenty of opportunities and I try to take advantage of each and everyone of them, light pollution or no light pollution. There are so many wonderful things to see, many are unaffected or only marginally affected by light pollution.. Always, always, always, get the largest aperture you can that won't break your bank account or your back. Aperture fever isn't just a state of mind. It matters. Just ask the folks at the European Southern Observatory (ESO), who are shelling out over a billion dollars for the new 39 meter Extremely Large Telescope (ELT). It will be the world's largest optical scope when it sees first light in 2024. Why are they building a 39 meter scope? 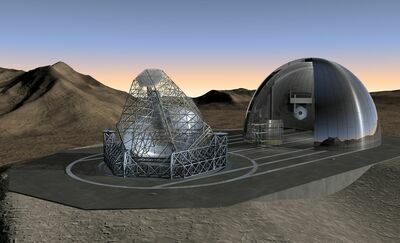 Because the 100 meter scope they wanted, the Overwhelmingly Large Telescope (OWL), isn't entirely feasible yet. Yet. Why do I have a 12"? Because a 22" or 24" isn't entirely feasible yet. Yet. Edited by hdavid, 19 March 2019 - 02:38 PM. Aperture fever is a state of mind: It's thinking that somehow a larger aperture will make your life better, that it will resolve frustrations and dissatisfactions. It's form of what my friend Bob calls, "Consumeritis." The acquisition mentality rather than the observing mentality. "If I only had a bigger scope.."
One thing I recommend to anyone considering a larger aperture scope, keep your smaller scopes too. There are a lot of times when a 10 inch, 12.5 inch or 16 inch is the right scope. I guess diffraction was not an issue. I hear you, Jon. I do enjoy my 12". Shows me all the detail in galaxies I could ever want to see. I could never want to see more than a 12" can show me. Maybe it shows me more than I really want. I might be happier with a 10". Or an 8". Easier to carry. I tell myself that all the time. Rationalization is also a state of mind. Jon, I agree. Made the decision for 12" max for my Dobs & 120mm for apo refractors (10" in theory for SCTs). But its a freeing decision. Because concentration on quality for chosen sizes can then go into your choices. And also decision on mounts size etc. The same applies to many consumer choices for any article really, where restraint or limit gas been established. Buying my F6 10" was an example, high grade mirror, less aperture, but hopefully top performance for the size. I heard sitting down will get you a lot more out of your aperture, too. I keep thinking of going 12" f5 for the capability. It would mean sitting up much higher and having to change seat height more. Also means I need a larger low power eyepiece to get 1.2 degrees. And if I stick to 18" base to get in the trunk, the 12" f5 has more height to base. But the extra capability is temping. Mostly I'm comparing 8" to 12" by memory. Also 12" does not really show all we want, or people would not pay for or set up 20". 12" just shows us enough that we can work with it on the harder stuff and still be wow'd on the bright stuff. Edited by stargazer193857, 22 March 2019 - 01:51 PM. For me, it's really a question of opportunity. I bought the 16 inch because the price was right and I built it into a scope that is both portable and potent. It definitely shows more, goes deeper than the 12.5 inch while still being manageable and transportable. 10 years ago, we saw our way clear to purchasing 4 acres with a small home and a garage in the high desert, a getaway and a place to observe. After a year or so, I realized that this was really a perfect location for a large aperture scope. A garage big enough to store it assembled, skies reasonably dark and clear. So, I decided I'd keep my eye open and see what came along. The 16 inch was plenty but this was an opportunity where a larger scope could be used without much hassle. At some point, a 25 inch F/5 Obsession became available at a good price, it was within driving distance. My wife and talked it over and we decided to buy it. I had it for about 7 years, an amazing scope. But as I was approaching 70, I decided it was just too much. The eyepiece was 10 feet off the ground, I observe alone, if I were to fall, that could be it for Jon. So, I decided it was time to down size. I found a 22 inch F/4.4 and bought it, sold the 25 inch F/5 and here I am today, the 22 inch is still a very potent scope but it is smaller and just the right size. Big enough but not too big. I think David is in a similar situation though probably the skies are not quite as dark. Some sort of a larger aperture scope that remained assembled and could be rolled out and ready in 5 or 10 minutes could be a good fit for him. I don't always use the 22 inch, the 16 inch gets a lot of use just because it is an easier scope, I definitely see more in the 22 inch so those nights when I am hunting down faint galaxy clusters, the 22 inch pays it's way. But there's plenty to see in a 16 inch and someday, if all goes well and I age gracefully rather than catastrophically, it'll be my number 1 scope, again..
Yep, feel the same about that.I would say get the biggest scope 'you can handle well' not what can buy. For me at time it had to pass through my doorways, if i had chosen the 20" it would have been an issue, also for me not to be forced to use a ladder was important, so in need only a small step wich i find reasonable.I am uncomfortable with ladders specialy in the pitch dark. I don't think we're in disagreement here at all. I didn't say get the largest aperture you can regardless. Otherwise, I'd have a two-billion-dollar 100 meter OWL by now. What I said was "get the largest aperture you can that won't break your bank account or your back." It's a simple formula. If it will hurt you financially, don't get it. If it will hurt you physically, don't get it. If it won't go where you want it to go, don't get it. If it's just too big for you for whatever reason, don't get it. You'll be confident that you're seeing the best you can see, and happy knowing that you did the best you could do. I don't think I heard anyone say that aperture doesn't matter. If it doesn't, it does. Of course, it's not the only thing that matters, but, obviously, it matters. Again, why do I have a 12"? Because a 22" or 24" isn't entirely feasible yet. Sadly, for me, nothing larger ever will be. And I'm quite sure that a 22" or 24" will not always be. But a window will soon open during which I'll be both financially and physically able to handle it. While that window remains open, be it short or long, I plan to take full advantage of it. In the end, I'll be happy knowing it was the best I could do. Edited by hdavid, 23 March 2019 - 10:05 PM. "Always, always, always, get the largest aperture you can that won't break your bank account or your back. Aperture fever isn't just a state of mind." I disagree with that recommendation. The largest scope one can afford that they can still manage is not necessarily the scope that will be the most productive or the most enjoyable. Big scopes are a bigger hassle and may just sit unused while a somewhat smaller scope may be enough easier and more observer friendly that it's a better choice. I am basing this both on personal experiences, friends experiences as well as what I see on the web. You've got your eye on a 20 inch plus scope. It might turn out to be the perfect scope but you might find out that something smaller would have been better. Also bigger scopes have narrower fields of view. A 31mm Nagler helps. I want a minimum of 1.2 degrees at low power. A 12-16" dob can do this with a big enough eyepiece, but now you have to transport the eyepieces and keep the alt stable when you change that eyepiece. A declocked 20mm Meade on a 10-11" scope gives a wide view and is no hassle. OK. I agree that we disagree. I guess we all have different reasons for being in the hobby. I just didn't imagine that seeing less than we otherwise could was one of them. One certainly has to know one's limitations. But I generally try to make sure that mine aren't self imposed. When you get your 24 inch scope and use it a while, you might have a change in your perspective. My testimony is similar to Jon's. My perspective changed dramatically when I stepped down to a 6" aperture from a C11. I thought I had lost deep sky forever. That turned out not to be true because I learned to emphasize the importance of the observer in seeing what we can. Rather than loose deep sky, I was forced to learn to see more. Observing became rewarding and my smaller aperture got used a lot because of it. I am not seeing what can be seen through larger apertures I dare to afford, aperture does rule. However, I appreciate what little I do see through the aperture I have and use...a lot. That paradigm shift was the single most important event in my observing lifetime. Of course we all want to see everything we can. David is certainly not wrong about that. In my view, the best scope is not the largest or not the most or least expensive, but the one we use and use well. And use often because we appreciate what we can do with it among other things: ease of use, affordable, etc. Edited by Asbytec, 27 March 2019 - 11:49 AM.